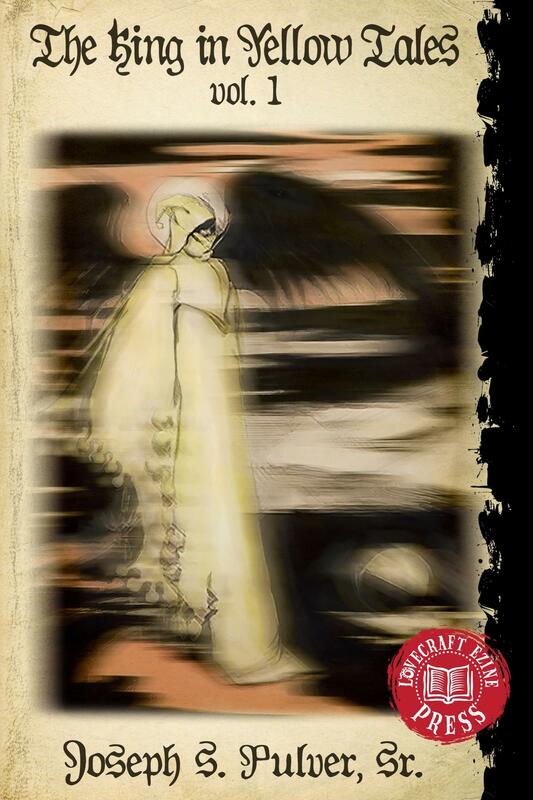 Raven God Games Brings Streamlined Role-playing to the Mythos with “Eldritch Tales”. As you’ll discover during the course of this interview, I’ve been eagerly following the progress of Eldritch Tales for a long time. I feel we need an RPG such as this for the Mythos market. There’s a number of them out there yet they’re either built on a kludgy system where its designers have chosen to concentrate on the art and flash rather than address core problems within the rules themselves or game designers have gone to the other end of the spectrum and given us games that are “light” nearly to the point of abstraction. 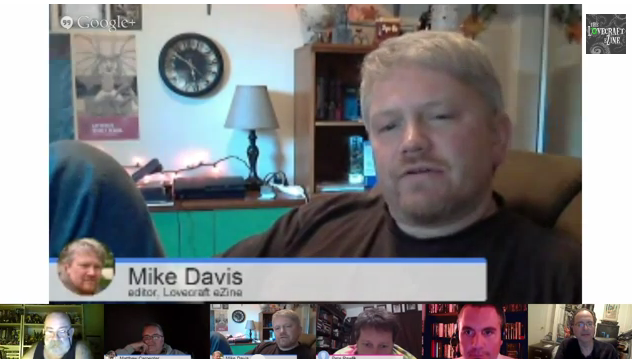 Joe Salvador, IMHO, has hit that fabled Goldilocks spot OSR gamers live for. Just enough rules to provide guidance when needed yet not so many they entangle the GM or the players. As someone who has been involved with Astonishing Swordsmen and Sorcerers of Hyperborea Joe has a proven track record of working on ground-breaking, highly playable RPGs so I held high hopes in watching the progress of Eldritch Tales. Yet even this did not prepare me for what a kind, industrious, and thoughtful individual Joe Salvador would prove to be. 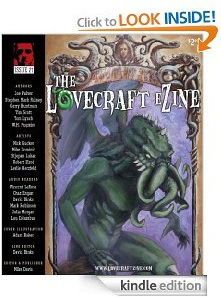 Lovecraft Zine: First of all Joe I’d like to say as someone who has been following the progress of Eldritch Tales I’m terribly excited to jump into the deep end of this interview but first I wanted to thank you on behalf of all of us here at Lovecraft Zine for taking the time out of your schedule to do this interview. With that said I always ask creators this question right off the bat, what does the term “cosmic horror” mean to you? Joe Salvador: Let me thank you for this opportunity to discuss Eldritch Tales. In my mind, cosmicism relates first and foremost to the feelings of smallness, of insignificance, and even of inadequacy. These are natural feelings that all people experience, but Lovecraft took those feelings and horrifically applied them to the human race as a whole in relation to the alien entities of the Mythos and to the antiquity of the Earth. It’s a stroke of genius really. The horror of cosmicism comes with realization of one’s meaningless existence. LZ: Yes. I love that feeling when I look into the night sky and realize I’m looking down and simultaneously vast distances away. It causes me to experience something akin to the camera trick Hitchcock utilized in Vertigo where he asked the cameraman zoom in while physically pulling the camera away to simulate the psychological effects of the film’s namesake. What are some of your favorite works written by Lovecraft? JS: This is a tough one. With all of the great tales HPL wrote, it’s so hard to narrow down favorites! 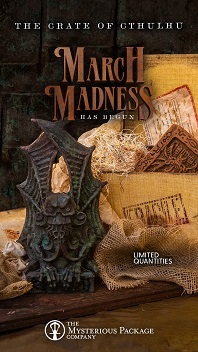 There are the “standards” – “The Call of Cthulhu” and “At the Mountains of Madness” – that clearly make the short list, but some of my other favorites are “The Case of Charles Dexter Ward”, “The Shadow Over Innsmouth”, “Pickman’s Model”, and “Dreams in the Witch House”. Each of these resonates with me for different reasons – horrific scenes, glimpses into Lovecraft’s imagined world, connections to the past, revelations of the multidimensional nature of the cosmos, but what stands out (in all of HPL’s work) is the terror of the suggested and implied. 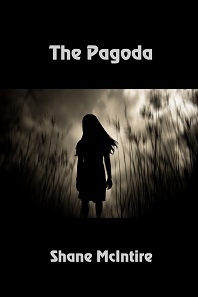 Often, the horror of these stories doesn’t come from what is on the page, but rather what comes to mind after the reading settles in and you give it some thought. LZ: I understand completely and I keep finding things I love as I go back and read Lovecraft as an adult. I notice details and themes I completely missed as a teenager which keeps me revising my list. Within the realm of weird fiction who are some of your other favorite authors? 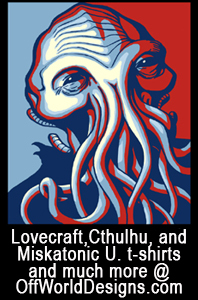 JS: I came to Lovecraft via Robert E. Howard, who remains one of my favorite authors. Other classic writers that I continue to revisit every year include Clark Ashton Smith, Algernon Blackwood, and Robert Bloch. Just last month I read Matt Ruff’s Lovecraft Country and Victor Lavalle’s The Ballad of Black Tom, both of which were instant classics for me. I’m excited to see modern authors taking the Mythos in new directions. LZ: Yes, I enjoyed both of those works and found they offered intriguing insights into that sense of dread intertwined with fascination that captivates me so. Touching back upon your insightful answer to question number two I love reading work’s such as Graham Harman’s Weird Realism, Mark Fisher’s The Weird and The Eerie or Eugene Thacker’s Horror of Philosophy series, works that use Lovecraft’s ideas or the themes of weird fiction as a whole as their launching points, and then returning to the works they discuss with those fresh insights. It intensifies that “beyond the page” feeling you described so well. What was the initial impulse that led you to conceive of Eldritch Tales and what are your goals with the game itself? JS: Eldritch Tales, which was conceived just at the end of 2015, sprung from two things. First, my love of early editions Dungeons & Dragons games had become reignited around that time, and I had taken to a game called Swords & Wizardry. S&W is a very adaptable game based on the original “white box” edition of D&D and it has been used as the basis for a number of games. Games like White Star, White Lies, and WWII: Operation White Box have shown that the S&W rules are easily modified and applied to non-fantasy genres. On top of that, because these games are based on the same rules-set, they can be combined to expand into other genres. For instance, if a referee wants to run a game of espionage set in a science fiction future, combing White Star and White Lies would do the trick. In my mind, a Lovecraftian game in the same vein was a necessity. 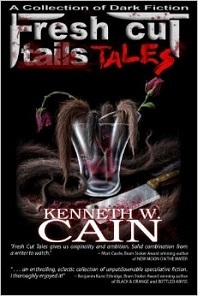 The second motivation was pretty simple – I needed a new project to occupy my mind, so Eldritch Tales was born. I have several goals with ET. I want to produce a Lovecraftian game that is entirely compatible with the other “white box” games, allowing referees to use it as written, or to combine it with other games to inject cosmic horror into different genres. Similarly, with little work, referees will be able to adapt the rules to any time period. With that in mind, it will be easily recognizable and familiar to OSR gamers, but at the same time, I hope that the simplicity of the rules will appeal to newcomers. I want ET to be malleable enough to allow the referee to tell any type of Lovecraftian story he wants. 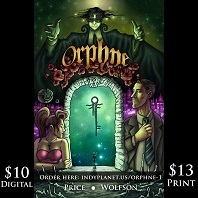 With ET, “purist” games that simulate HPL’s writing, investigative games, and more action-oriented pulp games (think R.E. Howard), will all be possible. Next, Eldritch Tales will be openly licensed for third-party creators to produce their own material, much like other OSR games. This will allow the game to grow at a rate that I couldn’t support alone and I’m sure we’ll see some great supplements from the community. Finally, I want to produce a professional product that is appealing to the eye and easy to use. In a similar manner the way in which you encapsulated the Lovecraftian world-view and mythos is delightfully succinct yet thorough. I was impressed that you brought in elements of not just Lovecraft’s work but also Clark Ashton Smith, Robert E Howard, and Algernon Blackwood to name just a few. How did you go about compiling such a large body of influences and then distill their essence so effectively without sacrificing the tone? I read your pre-release without artwork and it still captures the mood exquisitely. JS: Let me say, you hit on an extremely important point – simplicity of the rules. When I first introduced my stepson to D&D, I showed him the Pathfinder book. When he saw the size of that thing, I could literally see the enthusiasm drain out of his face. He’s now happily playing Charlie Mason’s White Box with his buddies. It’s what drew me back to OSR style games. I was tired of game sessions bogging down with crunching through rules and, as you said, “roll playing.” As a referee, I want to have the option to ignore the rules or make a temporary ruling and move on with the story. To answer your question, when I first started work on ET, I knew that I wanted to include elements from the various authors you mention. They all work together well on their own and combining them was a fairly straightforward process. I can’t say that it took much effort on my part. I also knew I wanted to step back to the original works and away from Derleth’s codification. In my opinion, that codification of the Mythos actually works against the creation of cosmic horror. We know what HPL said about “fear of the unknown,” but the Mythos has become a very known quantity in games. By drawing primarily from the original works, I’ve kept descriptions of creatures and places simple, with just enough to spark the imagination and leaving lots of room for creativity. In this manner, I’ve attempted to defamiliarize the Mythos to some extent (particularly for people just discovering HPL) and hopefully maintain the feel of the source material. LZ: I believe you’ve been particularly successful on this point, your descriptions were full enough to be playable, succinct enough to inspire curiosity and by noting the creator’s names (Lovecraft, Howard, Blackwood, etc.) and the story source where applicable people have the clues necessary to delve deeper should they so choose. Streamlining of rule-sets was definitely one of the attractions that drew me to the OSR and one of the many facets that has kept me here after all these years. My group is made of primarily people that have not played RPGs in years or have never played at all. They have careers, children, etc and are only familiar with the corporate multi-tome gaming systems. 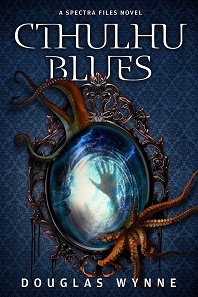 So I make it a point to show them LotFP‘s slight Rules & Magic volume and go, “This is it. All we use,” because most people do not have the time nowadays to absorb those huge data dumps of information. Another facet of the OSR that I have always loved is the community and the creativity of that community. I first discovered Eldritch Tales and Raven God Games through the blog Swords and Stitchery when he reviewed your adventure “Beyond the Ice Fall“. Upon reading that review I immediately purchased “Beyond the Ice Fall” and knew I had to find further information on anyone creating Norse-themed adventures based on Robert E. Howard’s “The Frost Giant’s Daughter” and Algernon Blackwood’s “The Glamour of the Snow”. How long after your discovery of the OSR was it that you launched Raven God Games and what sparked your creation of “Beyond the Ice Fall“? JS: I agree, the OSR community is very much a “do-it-yourself” group and there are always great new creations dropping on the web. It was several years after discovering the OSR that I created Raven God Games. I spent some time exploring all the different games, just drinking in the creativity and looking for the games that most appealed to me. 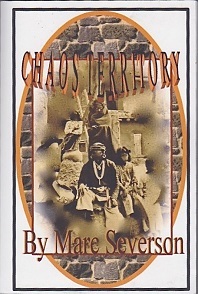 Like you were drawn to LotFP, I latched onto Astonishing Swordsmen & Sorcerers of Hyperborea. I wrote a micro-setting for that game with the intention of sending it to a fanzine. I sent the article to Jeff Talanian (the owner/creator of AS&SH) and he offered to publish it himself if I wrote an adventure to go along with it. 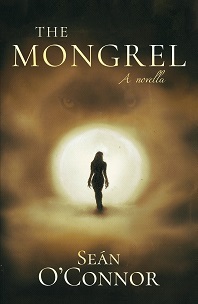 That project became “Forgotten Fane of the Coiled Goddess” which was my first foray into writing and publishing. I started RGG afterwards. “Ice-Fall” came about as a one-shot I ran for my group using AS&SH. I had recently read “The Glamour of the Snow” and it served as a basis for a quick, next-to-no-prep-time adventure. Norse/Germanic settings are one of my go-to’s and the Howardian influence is easily noted. With Jeff’s permission, that version (much cleaned up) was published in a fanzine called AFS Magazine. With a mind towards raising funds for the production of Eldritch Tales, I decided to make “Beyond the Ice-Fall” a more professional product. The version that is now available for sale is written for Swords & Wizardry and is slightly expanded from the earlier version. I have a follow-up adventure drafted, but it won’t see daylight until after ET is released. LZ: AS&SH is my secret crush. I have the second edition and keep staring at it longingly. It’s so beautiful, well done and I have one player, Vivian, whose mad for REH and loves playing exactly that kind of setting. I just need to carve out the time. It’s great news to hear there will be a follow-up to “Beyond the Ice-Fall” because there were so many great ideas within that adventure. That setting was truly memorable. 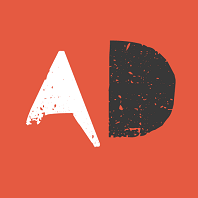 I was going to say one of my favorites yet even stringing the two words together may ruin some of the surprise so I’ll simply say, ” – abyss”. While reading the rules for Eldritch Tales I really enjoyed your take on the 1920’s milieu. To my eyes it read as if it had a Robert E. Howard influence to it. Would that be a fair assessment? If so, could you share with us some of you favorite works by Howard? JS: Yes, I suspect that REH subliminally influences a lot of my writing, so that’s probably very fair. I always come back to his writing for his direct style, visceral action and his history-inspired tales. In my youth, I was drawn to fantastic settings, but once I discovered REH in the Ace reprints, the tangible and familiar nature of the Hyborian Age really grabbed me. Another element that draws me to Howard is the connective tissue that he runs through his stories, which connects his sword & sorcery characters (Conan, Kull) to pseudo-historical characters, like Bran Mak Morn and those in his reincarnation stories. It gives his work the weight of an epic, but one that the reader has to piece together on his own. As far as favorites… I think “Beyond the Black River,” “Red Nails,” and “Worms of the Earth” top my list, but there are so many pieces that are just incredible. “The Black Stone” stands out as a great Lovecraftian tale, while “Pigeons from Hell” weaves folklore and cultural fears of the American South. Not to mention the breadth of his topics and characters – REH wrote fantasy, sports, historical fiction, horror, comedies, westerns, mysteries, poetry – and in many cases he combined tropes from other genres into sword & sorcery yarns, which is something I always enjoy. Where “Black River” is a western/colonial tale in disguise, “The God in the Bowl” has to be a police procedural, starring Conan. He even introduced heroic, “fighting women” to the pulps with Valeria, Black Agnes and Red Sonya. That’s clever work in an age when pulps were churning out very systematic stories. The influence of Howard’s stories on role-playing is undisputed, but it’s unfortunate that REH and the quality of his work are underrated in the more broad sense. In my opinion, he is one of the great fantasy writers whose imagined worlds are equal to Tolkien’s, and whose stories are far more gripping. LZ: Another aspect of Eldritch Tales I appreciated was how well the four character classes work together and support one another with their skills and abilities. What size of a party do you envision coming together for adventures and/or campaigns within Eldritch Tales? JS: That’s a great question, one that is touching on a concept from D&D that I never really conformed to – the idea that a party needs specific characters in its composition to succeed. I think that idea is founded with the expectation of a certain type of game, the dungeon crawl, or at least a game in which combat is expected. If combat isn’t an integral part of the game, you don’t need a healer, nor a “tank.” I’ve found that the game is often most rewarding when the referee builds the campaign around the characters that the players make. Though the bones are in place to play it in a more pulp-action format, at its core Eldritch Tales isn’t a “combat game,” so party composition is really up to how the referee wants to tell the story. 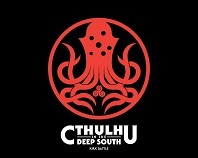 If he wants to run a scenario that stays close to the source material, for instance telling a story akin to Lovecraft’s lineage tales, one or two player characters would be great. Then again, if you are running a more investigative or action-oriented adventure more player characters might be preferable. I tried to make ET fairly malleable so that it can support different styles of gaming based on the referees goals, or the group’s interests… I hope that comes through in the work. So, I guess that’s a long way of saying, any size group with any types of characters can work with the right scenario. But yes, a group with four players, representing each of the character classes (Antiquarian, Combatant, Opportunist, and Socialite) is very well-rounded and should be able to approach Mythos mysteries from any number of directions. LZ: I know that you and I have discussed your plans to include an adventure with Eldritch Tales. I believe this is a wonderful idea as an introductory adventure can really tie all the threads together in a reader’s mind as to how the designer envisions their creation being utilized. It’s one thing to read the rules, another to see them being used in a living, breathing environment. Can you give us any hints as to the nature of this introductory adventure, such as time period, mood, theme, etc? JS: I have actually drafted three scenarios now, two of which have grown far longer than I can use in the core book. I can be a bit over-ambitious with adventures. At this point, I need to be concerned about page count and additional art. The third scenario, called “The Tupilak”, I hope accomplishes my goals as a starting investigation. 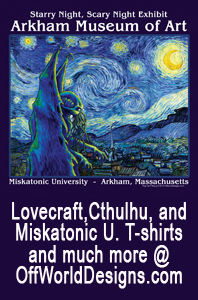 Without giving away too much, it is set in Arkham in the Spring of 1920, involves the University, and introduces the PCs to Mythos horror, without sending them all to the morgue (well, probably not). I hope it can serve as a springboard for a campaign or as a one-shot “test” adventure, as the referee chooses. Also, I’ve designed it to be fairly open to expansion, tweaking, and improvisation, in the hope of cultivating those skills in any new referee. As far as play style, I think it’s fairly traditional to other Mythos games – investigation, possible combat encounters and some horror. My “false starts” were a little different. They both have little by way of combat in their current form and would likely end with the PCs being somewhat left in the dark. Of course, I’ve not scrapped them and they will likely make an appearance as separate scenarios after some more writing. LZ: Question: Having read your excellent introductory adventure “The Tupalik” which will be included with Eldritch Tales do you as yet have any plans in motion for further adventures in the Eldritch Tales line? Earlier you spoke of Eldritch Tales being “openly licensed for third-party creators to produce their own material, much like other OSR games.” Could you please speak on this a little more for those readers who may not be familiar with this concept? JS: Yes, following the completion of the core rulebook, I plan to revisit the “false start” scenarios I mentioned previously, polish them up, and release them as products, either alone or as part of a “companion” book. To explain the license, allow me to step back a little. When the third edition of Dungeons & Dragons was released, it included something called the “Open Game License” (OGL) which allowed third-party companies to produce their own products that used the system and some specific material from the D&D game. The OGL also (perhaps inadvertently) allowed writers to recreate the earlier editions of D&D in new, easily accessible packages, such as OSRIC and Labyrinth Lord. This was the foundation of the OSR and nearly everything that has come from the OSR is somehow built upon the OGL. Part of the OGL agreement requires that new products released under its umbrella must also be considered “Open Game Content” and freely licensed to anyone interested in building upon it. So, Eldritch Tales is a OGL game, built upon Swords & Wizardry White Box, which is built upon the OGL itself. S&W also has certain licensing requirements in order to denote compatibility. That’s it in a nutshell; mind you I’m not a lawyer. It sounds complicated, but the OGL has allowed an amazingly creative community to establish itself and thrive. So, getting back to Eldritch Tales, I have created a compatibility logo which will be freely available and can be used on third-party products to denote compatibility with my game. To help other creators, I also plan to release my own art (not the art I’ve commissioned though) and cartography in downloadable packs (as Pay What You Want or for a small fee). 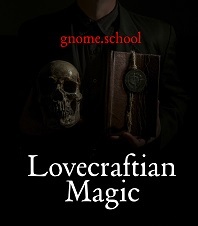 I sincerely hope to see other authors produce material; there’s so much Lovecraft to draw inspiration from (not to mention the other authors we’ve mentioned), I could certainly never hope to cover everything alone. LZ: Joe, on behalf of myself and everyone at Lovecraft Zine I’d like to offer my heartfelt thanks for all the patience, kindness and support you’ve shown over the course of this interview. Where can our readers find more information on Eldritch Tales, Raven God Games, and follow your future exploits? And in closing are there any projects in the works you’d care to talk about? JS: For anyone interested, they can check my blog (www.ravengodgames.com) or follow me on G+ (+Joe Salvador) for occasional updates on progress and new projects that I might be working on. Along those lines, I do have a few books on the slate. I mentioned the companion book earlier and this will include a number of alternate rules that have been cut from the core book, at least one additional class, as well as more spells, monsters, and artifacts. I’m also hoping to release a few setting books to expand Eldritch Tales into some other eras and locations. At least one scenario would be included with each of those as well. So, definitely some plans in the works! Acep, this has been a great pleasure. I’d like to thank you and The Lovecraft Zine for giving me the opportunity to talk about Eldritch Tales. You have done nothing but show me kindness and support for this project and I sincerely look forward to talking in the future! As a soundtrack for this interview I’m going to point you to Eighth Tower Records’ In Tenebris Scriptus – A dark aural tribute to H​.​P​.​Lovecraft over on Bandcamp, a marvelous dark ambient collection for you to stream. This interview was conducted by Acep Hale. Feature art and Elder Thing illustration by Kurt Komoda. Antiquarian illustration by Del Teigeler. Cover illustration (Cthulhu) by Eric Lofgren. Yog Sothoth illustration by Joe Salvador. ← The Lovecraftian film “THE ENDLESS” is now available!